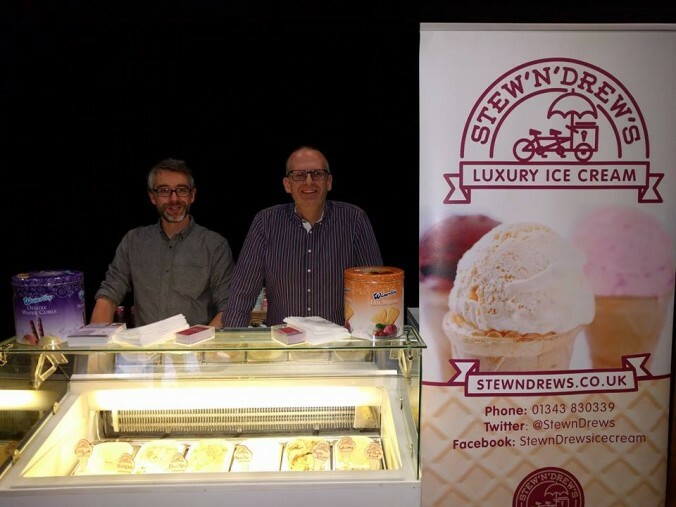 For the second year running, Stew ‘n’ Drew popped along to the North Hop food and drink festival in Aberdeen, bringing an eclectic mix of ice cream flavours for festival goers to sample and enjoy. Yet again our cask-strength whisky ice cream went down a treat. As did our recent BrewDog ice cream and sorbet creations since so much of the crowd at North Hop are craft beer enthusiasts. Our Green Apple & Wasabi ice cream made a comeback, surprising and delighting those who tried it, with some adventurous souls coming back for more. We didn’t neglect to offer some of our more traditional flavours either and the entire weekend was a blast, meaning happy days at North Hop for Stew ‘n’ Drew. Stew ‘n’ Drew truly put the fun into a Friday night when we dropped by BrewDog in Aberdeen with a couple of crafty surprises. In a special collaboration with the Scottish craft brewer’s Castlegate branch, we created two brand new flavours using BrewDog beer. 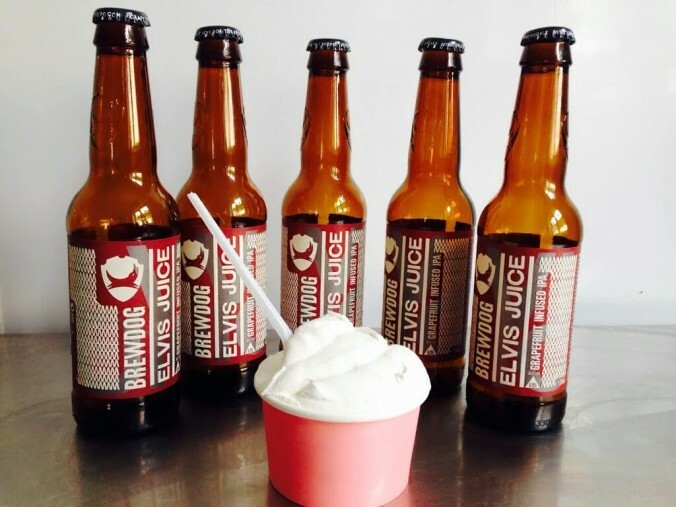 The Granite City party crowd got a taster of the milk stout goodness that is Jet Black Heart ice cream as well as the kingly Elvis Juice sorbet (pictured), a hoptastic grapefruit kiss of a dessert. Suffice to say the results of Stew ‘n’ Drew’s meets BrewDog went down very well with craft beer fans. Cheers folks! 2015 got off to a great start with the arrival of the first of January, which we had safely predicted. We then hit the headlines with our ‘Buttery Bombshell’, as STV described it. We’d only gone and made ice cream with butteries. Some people were outraged, like the Daily Mail where we ended up on the same page as Kim Kardashian and home secretary Theresa May, neither of whom had done anything remotely clever with butteries. Despite the odd critic, anyone who tasted our Wowee Rowie / Lovely Buttery ice cream gave it the thumbs up. Plus we got to blether about our breakfast-pudding mash-up on the radio. Next up were the National Ice Cream awards where we were recognised not because we’d been in the Daily Mail, but for the quality of our ice cream. We received a number of Merits and, best of all, our Dairy Vanilla placed fourth in the UK. With spring in full swing, we made our debut at the North Hop food and drink festival in Aberdeen, taking our place alongside the likes of BrewDog, Fresh Revolution and Aye Love Real Food. We particularly enjoyed feeding our cask-strength whisky ice cream to a contingent of Norwegians and were delighted when one food blogger declared Stew ‘n’ Drew’s ‘some of the best ice cream I’ve ever had in my life’. The best day of our year was undoubtedly July 1st when we opened the doors of our first ice-cream shop in Hopeman. It also happened to be the hottest day of the year. We couldn’t have scripted it better as the TV cameras turned up and Stew and Drew were beamed into living rooms across the country, causing anyone who knew them to nearly choke on their supper. Another 2015 highpoint was our nomination for Best New Business at the Highlands & Islands Food & Drink Awards. It was fantastic to receive such early recognition for our efforts and we duly got suited up – kilted up in Stew’s case – for the gala dinner in Inverness, which was a proud night for the pair of us. We were also thrilled to see The List magazine include us in their Best of 2015 for Scottish food and drink. Referring to us as ‘the ambitious duo’, they majored on the buttery ice cream. What else happened this year? Well, the Stew ‘n’ Drew’s ice-cream bike graced lots of weddings and galas. We impressed top Scottish food writer Sue Lawrence, who described our ice cream as ‘delish’. 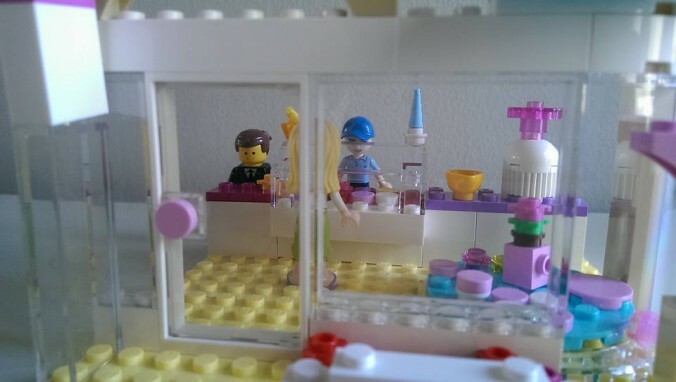 We made a Lego replica of our Hopeman ice-cream shop. We invented Stewsday and Drewsday, two additional days of the week that can only be accessed with one of those time-bending watches you can buy in Argos. Oh, and a man travelled all the way from France to eat our ice cream. C’est vrai! We made Green Apple & Wasabi ice cream, which got right up folks’ noses, but in a good way. We made Fig & Honey, Chocolate Pretzel, Mango & Elderberry, Peanut Butter & Jam, Key Lime Pie, German Chocolate Cake, Scottish Tablet, Cherry Chocolate, Eton Mess… and Superman, our most popular flavour of the year. The Stew ‘n’ Drew’s range now numbers more than 90 flavours and, as well as the shop in Hopeman, our luxury dairy ice cream is supplied to hotels, restaurants, parlours, cafes and delis from Aberdeen to Cromarty. What will 2016 hold? Hoverboards, surely. And further adventures in ice cream. Merry Christmas ice-cream lovers and all the best for the year ahead. 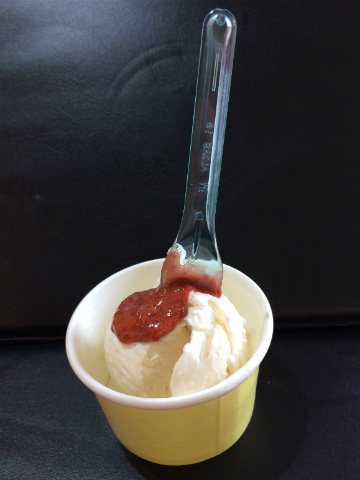 The first Stew ‘n’ Drew’s ice cream shop is here and we hope you like it. We were going to have it in Paris, but Hopeman seemed to make more sense. The shop is just yards from Stew ‘n’ Drew’s HQ. Our super-duper cabinet showcases an ever-changing feast of 24 flavours from the Stew ‘n’ Drew’s range. Your biggest challenge will be making a final decision, but we’re here to help you with that. 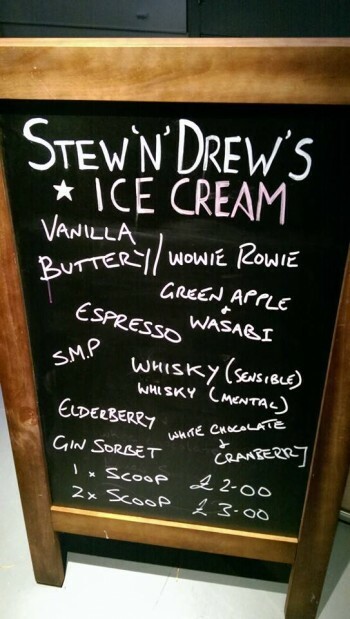 Come and discover ice cream the Stew ‘n’ Drew’s way. We’re heading for Venus. Well, Inverness actually after being shortlisted for Best New Business in the Highlands & Islands Food & Drink Awards. We congratulate our fellow finalists Gordon Castle, North Hop, Muckrach Country House Hotel and Dunnet Bay Distillers ahead of the awards ceremony in the Highland capital in October. Meanwhile we’re off for a celebratory slider to the tune of Eighties Swedish rock. Take it away Europe! The Stew ‘n’ Drew’s bandwagon rolled into Aberdeen recently for what was a big weekend for us in the Granite City. 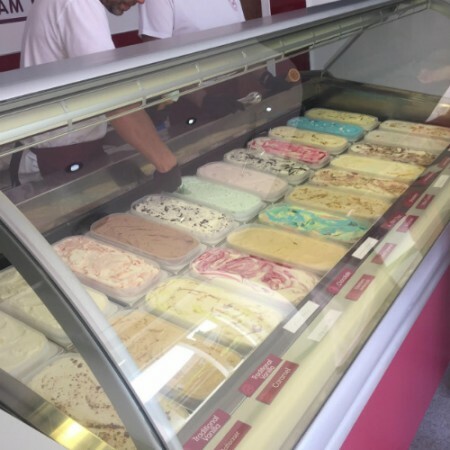 Our ice cream hit the Cones and Candy ice cream parlour in Westhill for the first time – where you can now choose from dozens of our flavours – and there was our appearance at the North Hop festival at the Lemon Tree. We brought along the ice cream bike and blackboard for this day-long celebration of food, drink and live music. As you can see from the blackboard, we pushed the boundaries somewhat with our offerings. Wowie Rowie went down well with an Aberdeen audience while Green Apple & Wasabi proved a hot ticket. First to run out was the Whisky (Mental) which is our ice cream made with cask-strength whisky. One spoonful and we even had one customer swearing at us. In a good way. Here’s our latest towering achievement: a skyscraper of a celebratory cake, featuring tiers of Oreo ice cream, salted caramel wafer and coconut with layered chocolate sauce. This colossal cake was served at an engagement party at the Albyn Hotel in Aberdeen and proved to be a real hit with the guests. 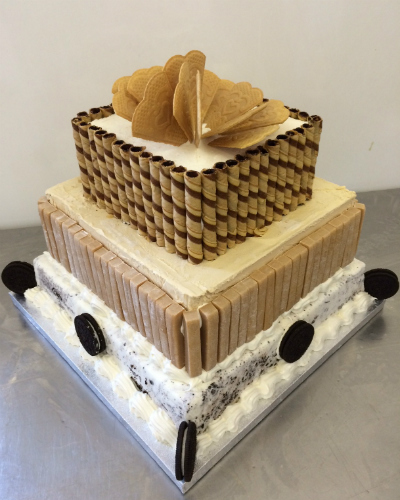 If you fancy the idea of Stew ‘n’ Drew’s creating a stand out ice cream cake for your special occasion, get in touch. We were reared on butteries, or rowies as some call them. Or the Scottish croissant as no one calls them. This breakfast staple of the north-east is a splendid delicacy and so we have made ice cream with it. Some have said this was a ridiculous thing to do. Others claimed it was just plain wrong. Well, now that we’ve launched our Lovely Buttery (or Wowie Rowie) ice cream into the world, we reckon the proof is in the pudding and that it wasn’t such a crazed idea after all. Don’t knock it till you’ve scoffed it. To us north-east boys, STV was always Grampian. We didn’t have Glen Michael’s Cartoon Cavalcade, like Central Belt viewers. 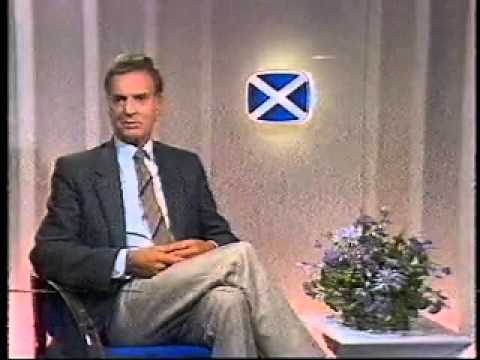 But we did have Kennedy Thomson introducing Chartburn, Frank Gilfeather reading the sports news on North Tonight and adverts for the Bon Accord Centre. Anyway, where were we? Oh yes, STV recently interviewed Stew ‘n’ Drew. We talked about our journey so far and our aims for 2015. There are mentions too of our forthcoming appearance at the North Hop festival in Aberdeen and ‘beer ice cream’. STV call us the ‘Ice Boys’ and we like that. Makes us sound like rappers. Nice rappers, mind.